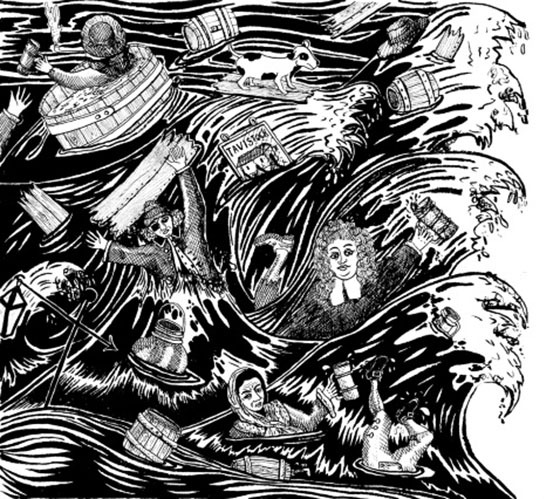 On this date in 1842, eight persons were killed in the London Beer Flood when a a series of vats at the Meux and Company Brewery ruptured, causing more than 323,000 imperial gallons (about 388,000 US gallons) to spill into the streets. The brewery was located in an poor neighborhood where families lived in basement rooms that quickly filled with beer. Florida man robs salesman at gunpoint, sends apology text. "Bro, I was on Mollies, I'm sorry." Some people born on October 17 who said some interesting things: Richard Roeper, Jimmy Breslin, Michio Kushi, Rita Hayworth, Arthur Miller, A.S. Neill, and Elinor Glyn. Can extinct species be revived by tweaking the genome of still-living close relatives? Who rules America? Odds are it isn't anyone you know personally. Here's what to do if you have a Samsung Galaxy Note 7. Note, however, that some Note 7 owners plan to hold on to their phones despite the recall, citing the device's unique features and willingness to take the risk, despite the fact Samsung has no idea why the Note 7 keeps catching fire. Why French pigs say groin, Japanese bees say boon and American frogs say ribbit. The Humane Society calls a Trump presidency ‘a threat to animals everywhere’. NFL ratings plunge could spell doom for traditional TV. Election years often thin sports ratings, but the NFL has never seen a drop as dramatic as this year’s, Nielsen data shows. In 2008, for example, ratings over the course of the year declined 2 percent, and in 2000 they declined 10 percent. During the first five weeks of this year, ratings have declined 15 percent compared with the entirety of last year.